As I've mentioned in a previous post (5/3/05) one of my hobbies (social experiment) is taking photos of really trashy yards. The best places to find trashy yards happen to be in trailer parks. 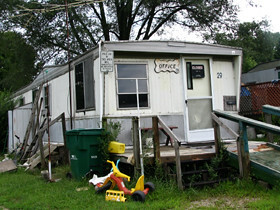 Over the weekend I stumbled upon an excellent trailer park in Centerville, MI that had a lot of great trashy yards. Unfortunately I wasn't able to get shots of the confederate flag used as a curtain or a wood shed that was entirely spraypainted with "Jim loves Jenni." The only shot I managed to get was that of the trailer park's office. (Believe it or not this trailer looked better than most in the neighborhood). The reason I couldn't get anymore shots was this trailer park seemed to be a hot bed for drug activity. That meant as soon as I drove in I was being watched by the residents. This became obvious when I noticed a guy walking around with his cell phone looking in my direction. Then I noticed the guy from the trailer with the confederate flag curtain walk across a couple properties to join him. They were doing their best not to act like they were watching me... they obviously were. They also positioned themselves at the trailer parks only exit. So I had to drive by them to get out... needless to say I had a couple nervous moments.